General McMaster on Monday assured Prime Minister Muhammad Nawaz Sharif that administration of President Donald Trump was committed to strong relationship with Pakistan. 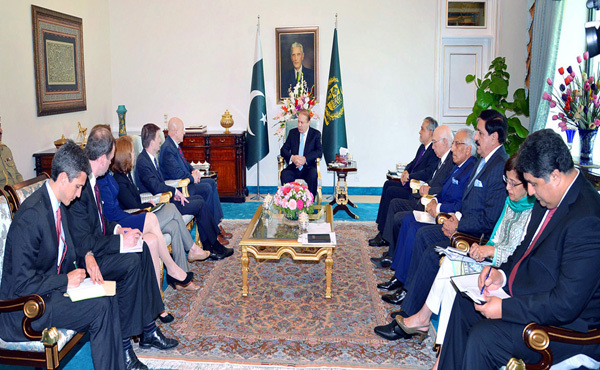 assured the Prime Minister that the new Administration was committed to strengthening bilateral relations and working with Pakistan,” a PM’s Office statement said relating to a meeting between the Prime Minister and the US National Security Adviser here at the PM House. Pakistan under the Trump administration. the efforts and initiatives of his government that had resulted in a marked improvement in the overall security situation. of a “new Pakistan” were being widely acknowledged and appreciated by the international community. He said the across-the-board consensus achieved by his Government to combat extremism and terrorism and structural reforms in economy had laid the foundation of a moderate, progressive and democratic Islamic Republic that was ready to do business with the United States and the world at large. forward to forging a strong and mutually beneficial partnership with the US and to working with the new US Administration, to promote peace and security in the region and beyond. neighbourhood and apprised the US NSA of the steps taken by Pakistan to reach out to both India and Afghanistan. Afghanistan and the continuing impasse, the Prime Minister conveyed Pakistan’s readiness to work with the International community to explore ways in which the Afghan crisis can be resolved. conviction on sustained dialogue and meaningful engagement as the only way forward to resolve all outstanding issues between India and Pakistan including the Kashmir dispute. resolve their differences particularly on Kashmir and noted that this could go a long way in bringing sustainable peace, security and prosperity to the region. Special Representative for Afghanistan and Pakistan Laurel Miller, National Security Council Senior Director for South Asia Lisa Curtis and National Security Council Director for Pakistan John Jay Wise. The meeting was also attended by Minister for Finance Muhammad Ishaq Dar, Advisor to PM Sartaj Aziz, PM’s Special Assistant Tariq Fatemi, NSA Lt. General (R) Nasser Khan Janjua and other senior government officials.